AMAZING: The IPCC May Have Provided A Realistic Illustration | Watts Up With That? In the post Is Ocean Heat Content Data All It’s Stacked Up to Be? I explained all of the problems associated with Ocean Heat Content data, in great detail. For that post, I created three gif animations that showed where temperature measurements were taken at three different depths. The intent of the animations was to show how few samples existed at depth throughout the global oceans before the introduction of ARGO floats. Temperature sample maps at 250 meters (11MB). Temperature sample maps at 500 meters (9MB). Temperature sample maps at 1500 meters (6MB). I was examining the approved Chapter 3 (Observations: Ocean) of the IPCC’s 5th Assessment Report when I came across their Figure 3.A.2. I was amazed, especially with the bottom 2 cells. Figure 3.A.2 appears to be a realistic presentation of temperature sampling at depth. A larger-sized version is here. The bottom cell shows that temperature samples at depth did not rise above 20% coverage of the oceans in the Southern Hemisphere until the ARGO floats were introduced in the mid-2000s, and at depths below 900 meters the coverage was less than 5% before ARGO. The Northern Hemisphere (middle cell) was better sampled, but anything is better than nothing. Most of the sampling there was confined to depths of less than 500 meters from the late-1960s to present. And looking at the top cell, sampling at depths of 0-1500 meters and 0-1800 meters did not rise above 8% of the global oceans until the ARGO era. Consider that the next time you see the NODC’s ocean heat content data for 0-2000 meters extending back in time to 1955. Measurements for 0-900 meters had less than 16% coverage before ARGO. 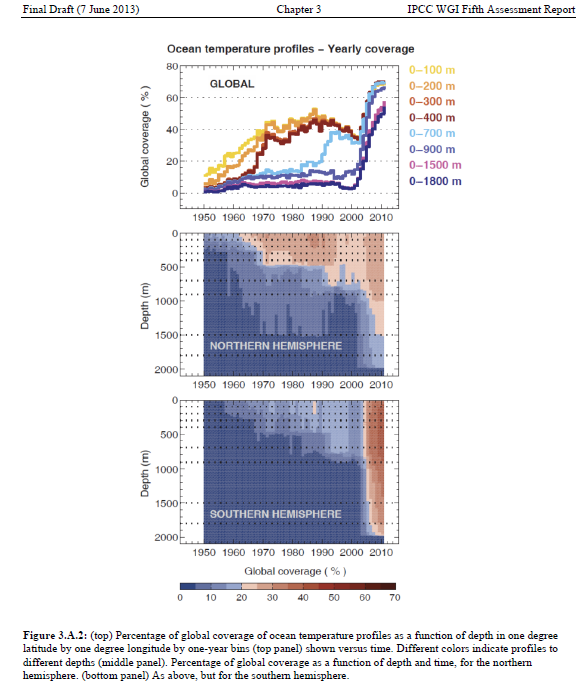 Sampling at depths of 0-700 meters did not reach 20% coverage of the global oceans until about 1990. I’ve noted this a number of times before: the NODC should be commended for the amount of work that went into assembling all of the data required for their ocean heat content datasets. But the NODC cannot be praised for their portrayal of their ocean heat content data as a globally complete dataset with little uncertainty. 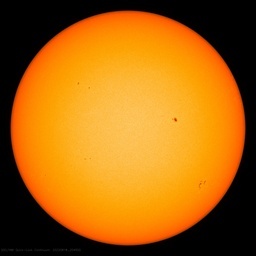 Refer also to the discussions of the natural warming of the global oceans (including ocean heat content) in my illustrated essay “The Manmade Global Warming Challenge” (42mb). Speaking of amazing, I haven’t promoted my ebooks Climate Models Fail or Who Turned on the Heat? anywhere in this post. October 9, 2013 in IPCC AR5 Report, Obama Climate Plan. 5% coverage can be plenty if the sample is representative and consistent with time. I would doubt this, however. You do an absolutely wonderful job in collecting and analysing data which most of us do not have the time or energy to do ourselves. The deep ocean temperature measurements are astonishing. The Pacific does seem to be seriously undersampled.and how anyone can say anything about its heat content is amazing. I really do believe that it is people like yourslf who is turning the tide of CAGW by exposing data that allows us to be properly sceptical. Just love their choice of colors in the bottom two charts. It’s as though the blues / oranges were meant to suggest temperature differences, not the mere presence-of-thermometers. In discussing the issues around global sea temperature data with a friend, I posed the question ‘if you had a thermometer accurate to three decimal places, how accurately could you measure the temperature of an olympic size swimming pool?’ After we had gone over the problems involved with the task, I then pointed out how much more difficult it is to take the ocean’s temperature. After that, my friends views on the veracity of IPCC claims of rising ocean heat content were less than complimentary. I’ll try to update those animations one of these days. Thanks Bob, I always enjoy your posts. I think praise needs to go to the person who created the gif animations as well. A lot of work went into making it easy to read and understand for everyone. Thanks Bob. Bob, thank you. It appears heat content in the past has largely been the blind men and the elephant exercise. The next point is would does “100% coverage” mean in this language ? One reading per 5×5 degree grid cell or what? Each individual temperature reading is supposed to represent what volume of water? How many million cubic km of ocean has been measured to with 5mK by one thermistor? Again substitute statistical sigma calculations for experimental uncertainly. Comparing your animations and Fig. 3.A.2 puts the lie to their claims of coverage. It’s only a fraction of a percent even with ARGO. The size of the dots in your figures, of neccessity, greatly exagerate the area covered by each float. Have these people ever thought to build a string of thermometers, one every 100 feet, that went from the ocean floor to the surface? They could get baseline understanding of how much temperatures fluctuate over time and give them a more realistic idea of what, if anything, the ARGO numbers mean. Having at least 1 sample per grid cell should definitely NOT constitute 100% coverage. Sure it gives you a value for each cell, but you have no idea what the variability is within the cell, so your error bars are likely too large to be useful given the minute differences being analyzed. I would love to see a study that calculates the undersampling error involved, which is a function of both the variability of the cell and number of samples in the cell. I doubt even the Argo probes provide enough samples to narrow down the accuracy lower than the anomaly we are attempting to investigate. And how the heck do they handle the majority of cells that don’t even have a single measurement? Agreed – the unwary reader will assume, if skimming, that these graphs represent increasing global ocean temperatures at depth. That’s what my lying eyes saw before I looked again. Thanks, Bob, for your great work. From the ARGO website each float is intended to cover a 3 x 3 degree^2 square. At the equator this is approximately 40,000 square miles. For comparison, Lake Michigan has a surface area of 23,000 square miles. So it would get one half an Argo float to measure its temperature. The coverage is incredibly sparse. We humans have a history of coming to sweeping conclusions with very little information. These conclusions invariably turn out to be wrong, yet we continue to believe we will be spot on the next time we do it. Quite remarkable, really. Is the dark blue really representing less than 5% or zero? Those graphs would be much clearer if 0 was white. Perhaps the IPCC has only published these diagrams to demonstrate that the ‘missing’ heat could be stored in the unmeasured depths. I would have done red-yellow-green like MS Excel, but to be fair blue-yellow-red might be the default pattern for the intensity charts they use. And the blue does look “oceany”. The IPCC provides an accurate and balanced view of some aspect of climate science? Greg, that was my thinking when I looked at the charts. 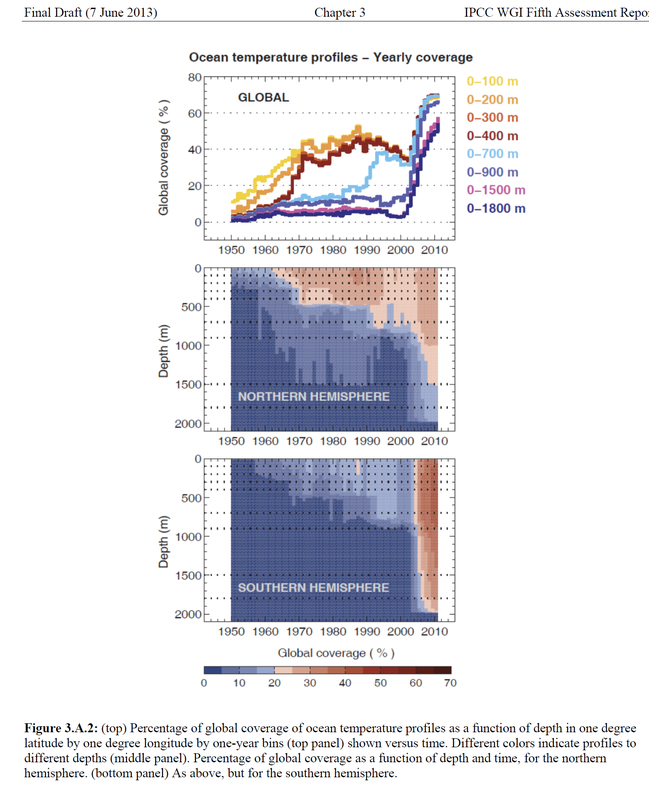 As a result the IPCC is still way over-stating the coverage. In reality most of the numbers would round to zero. The only way we will ever understand ocean heat pre-ARGO is with some kind of proxy. Mr. Tisdale : Please email me at kip at my domain i4.net, I have a collaboration project to discuss. Thanks. peter thorne has done an excellent job on the observation chapter, unlike the job that jones and trenberth did for Ar4. Folks should give credit where credit is due. The less we know, the hotter it “is”. So what does 5% coverage mean? It is pretty clear that 20% of the ocean area or volume is not filled with Argo floats. How big a range are they assuming for each float at 100%? I thing this is an excellent point and one that applies to all temperature data sets. I’m not convinced that the average of sparse measurements will ever give us any global temperature because heat is simply not uniformly distributed on earth. If you figure the amount of area a thermometer is measuring it is probably a few square centimeters around the thermometer. Any further interpretation of that temperature a distance away requires an ever increasing error bar until the data becomes useless. We know the temperature on one side of a house can vary by several degrees to the other side of the house. Just by taking the gridded measurements from one ARGO area and finding the variance within the area it is suppose to represent we should be able to find the true error of the measurement. I suspect this would be many times larger than the accuracy of the thermometer. I think it’s probable that nearly all the anomolies measured are dominated by the distrubution of heat transfers across a non-uniformly heated area. Another words the heat can come in and out of the area covered by our thermometers and we would have no idea since 99.9999% of the earth is not measured. I think Greg clarified that above – 100% coverage is one Argo float in each 3 degree x 3 degree grid. I love his analogy – Lake Michigan would get a half an Argo float. Will we see “Tisdale says IPCC got it right!” as a recurring meme the way we’ve seen endless variations on “Trenberth looking for missing heat!” now that they’ve both made essentially the same point? MarkB, you apparently missed the point of this post. This post supports my past posts that concluded ocean heat content is a contrived dataset. I’m not sure how you could have missed that. Thank you again Bob for your diligent, informative work. I suggest that spatial coverage of the Terrestrial Surface Temperature (TST) data may be more dense that the oceanic temperature database, but the TST data is also highly erratic and subject to a serious warming bias due to poor instrument siting, growing urbanization and UHI effects, etc. When we examine the IPCC’s reports, we are certainly seeing humanmade global warming… …but much of it is instrument and analytical error. Remember that we are actually measuring a volume, approximately 100,000 km2 in area but 2 km deep, for each float. The volume of all the Great Lakes together is approximately 23,000 km3. Each Argo float is (supposedly) measuring about 9 times as much water as the total of all the Great Lakes. Dear Bob, thanks for another excellent post! WUWT readers are enriched by your input and we appreciate it greatly. No wonder whales go crazy. This is WHOPPER! This is not a shot across the bow. This is a direct hit on the good ship Climate Hysteria. You would have to commit statistical fraud to even think you had an inkling of an idea on long term ocean heat content. Or just outright lie. So we have ginned land temp and ocean heat content records. Now we just need to sink the ocean acidification meme and that will effectively cut off all three legs of their tottering stool. What might we learn if all the argo floats were deployed in one grid? excellent post bob,your work is is much appreciated. i have to agree with allan macrae,whilst there may be a higher density of measurement on land,the extrapolation required to assume total coverage is still ridiculous. gonzo,you are spot on,i personally believe they have no problem just telling outright lies. Bob’s earlier post has some interesting graphs, but misses out something that can properly relate this heat to temperature. According to the post, the Argo floats showing the top 700m oceans heating up a the rate of 1.392*10^22 Joules a decade. What does this actually relate to in celsius? I will stick to metric here. Allowing for the shallows, that is about 200 million km^3 of water. As 1 km^3 is 10^9 (billion) tonnes of water, that is about 2*10^17 tonnes of water. As there are 1000 kilos in a tonne and 1000 grams in a kilo, there are about 2*10^23 grams of water in the top 700m of ocean. Why the calculation in grams? I looked up that it takes 4.184 joules of heat (= 1 Calorie) to heat 1 gram of water through 1 degree celsius. So that 1.392*10^22 Joules a decade equates to .0017 celsius a year on average, or about 600 years for the oceans to rise by 1 degree. Is that about right? Or am I out by 10^n times? If so, what is the calibrated accuracy of an Argo buoy? Given on average 3 buoys cover an area the size of Britain, and only sample at each depth every few days, an average trend of 1/600 of a degree celsius per year (when areas of ocean can show seasonally adjusted fluctuations of over 1000 times that amount from Bob’s animation) does not strike me as awfully robust. Once again the IPPC have produced images for the illiterate masses of 190 countries that expect to see hockey sticks and rapidly increasing red orange areas on graphs, that will be translated to them by others who don’t read English well. It just isn’t global atmospheric temps this time around.